Ocean wave power is a technology which harvests electric power from the dynamics of wave movements. Ocean waves are generated by the combination of forces due to the gravity, sea surface tension and the action of the wind passing over a large stretch of water are the main factors in determining the origin of sea waves. Once generated, oceanic waves can travel virtually lossless over long distances and anyone who goes surfing or has been hit by a large ocean wave knows how powerful they can be. Oceanic wave power captures the kinetic energy of the movement of the waves and converts it into electrical power. Ocean waves transport energy and in many respects, the technology used in ocean wave power is the same as it is with tidal energy and hydro-electric power except this time its the sea’s wave motion which is converted into mechanical energy by using a wave power mechanism. The waves kinetic energy turns a turbine attached to a generator, which produces electricity and the best part of ocean wave power is that it is clean, renewable, almost continuous, and does not pollute the atmosphere contributing to acid rain and global warming. The energy in an ocean wave consists of both the kinetic energy of the moving water, and the potential energy associated with the up-and-down peaks and troughs of the sea water above and below average sea level. A simple mechanism which can be used to harness this up-and-down motion of the waves and convert it into an air flow under pressure is called an Oscillating Water Column or OWC. An oscillating water column, OWC, such as Wavegen’s energy device converts wave motion into air flow. 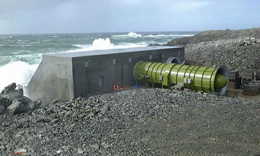 It consists of a partially submerged wave chamber that is constructed from concrete and fixed on the shoreline. Part of the oceans surface is trapped inside a chamber which is open to the sea below the water line. The up-and-down movement of the internal water surface cause the air trapped inside the chamber to rise and decompress behind a breakwater in response to the movement of the incident waves outside the chamber. The waters height H (crest to trough) is proportional to wind intensity and duration of the outside wave but it can achieve a significant water height. The air in the chamber is compressed and sucked through an air turbine due to the generated overpressure and underpressure. The air is allowed to escape through the top (or sometimes side) of the chamber through a turbine which forces the propeller to rotate, which, in turn, spins an electric generator shaft. A conventional air or wind turbine requires one single direction of air flow through its turbine blades in order for it to rotate. However, a special type of air turbine has been designed to continue turning and producing torque on the turbine shaft in the same direction irrespective of the direction of the airflow across its blades. One such air turbine used in oscillating water column systems is called a “Wells Turbine”. A Wells turbine can be used to drive an asynchronous induction generator from both the inward and outward motion of the air through its blades. Therefore, the Wells turbine has the capability of turning regardless of the direction of airflow providing rotation in the same direction for both the inward and outward movement of air. The advantage of this type of ocean wave power device is that it can convert waves of varying amplitude and direction into useful energy, whilst being robust enough to withstand very rough weather and storm conditions at its given shoreline location. Also, the wave energy generator mechanism avoids damage due to the force of the waves or corrosion because the housing where the air turbine blades and generator are mounted do not come in contact with the seawater. However, the disadvantage of an oscillating water column is that it is a pneumatic system with the air rushing in and out of the turbine making it very noisy, unless a silencer is fitted to the turbine. But the noise is not a huge problem anyway, as the waves make quite a bit of noise themselves. Also, this large concrete ocean wave power system consists of a chamber built on the shoreline and as it depends on the intensity of the waves, needs a suitable site where the waves are consistently strong which could result in it having an environmental impact. Ocean wave power devices are not expensive to operate and maintain but are still a relatively immature technology with a lot of technical and operational challenges. Ocean wave power devices come in a variety of designs and can be used both on the shoreline, near to the shore or out at sea. Like other forms of hydro power, ocean wave power does not require the burning of fossil fuels, which can pollute the air, and no waste is produced. Making the energy it produces entirely clean and endlessly renewable. For more information about “Ocean Wave Power” and how to generate your own electricity using the power of the sea, or obtain more wave energy information about the various wave power systems available, or to explore the advantages and disadvantages of wave power, then Click Here to order your copy from Amazon today about ocean, tidal and wave energy, the new energy revolution from the sea. I want to make a simple wells turbine for making a project on wave power. Can someone help me with its design. Like number of blades, angle at tail end, width of blade etc. total length of blade. My total turbine diameter must be around 15 cm. thanks.